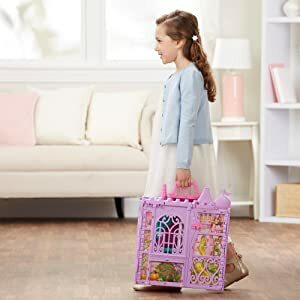 The Disney Princess Pop-Up Palace is perfect for small places and on the go kids! Last week we got the chance to go for Sweet Suite by The Toy Insider and had an absolute blast! Sweet Suite is an event for bloggers and social influencers to meet with toy companies and get a sneak peek at the newest toys being released for 4th quarter. Mommy Elf got an invite because she writes the lifestyle blog Serendipity and Spice– so she was actually the one who got to go and we just got all the benefits of playing with the most awesome toys! We’ll be sharing all of the goodies on our new YouTube Channel called Santa’s Toy Testers…make sure you subscribe! 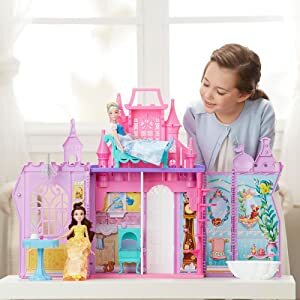 Check out the Disney Princess Pop-Up Palace toy review and see how awesome this toy is! 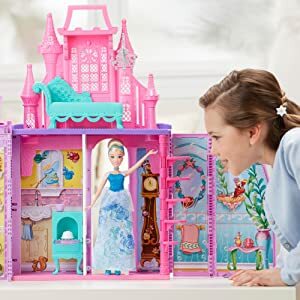 Anyway, the Disney Princess Pop-Up Palace is the perfect toy to take on vacation! We actually took it to Florida with us and it was perfect because all of the dollhouse furniture fits right inside and then it closes up for easy carrying. Once we checked into our condo, Elf 1 claimed the corner of the living room with a desk, while Elf 2 claimed the corner of the living room between the dining room table and the TV. Once we opened up the Disney Princess Pop-Up Palace Elf 2 had a pretty awesome little corner to play with all of her dolls. Kids will love recreating magical moments from their favorite fairy tales in the Pop-Up Palace! This beautifully detailed castle triples as charming playset, useful storage, and carrying case. 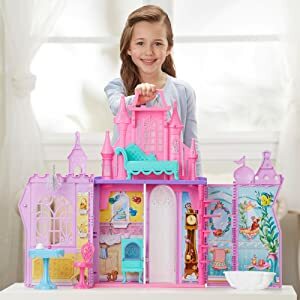 With a nod to several Disney Princess characters in each room setting, this magical castle is a great place for little ones to play out all their favorite Disney stories! Extend the play space, double the fun. Open the grand doors to reveal beautiful room settings waiting to be filled with Princess-themed accessories. Then, with the press of a button and the pull of a handle, the Pop-Up Palace expands to 2 fun-filled levels! The beauty of this palace playset lies in its versatility. It is royally arranged when kids are ready to play and easily compactible when parents are ready to pack up the playroom. The Pop-Up Palace includes 5 different room settings, 4 of them inspired by a different Princess — Aurora’s kitchen, Cinderella’s foyer, Ariel’s bathroom, and Belle’s dining room. The extendable second story is a luxurious lounge. Fill each room with accessories, like a shell-shaped bathtub, rose-detailed table and chair, royal lounge seat, kitchen stove, and more! Hang the silver-colored chandelier in either the dining room or the lounge to add some royal ambiance. Swivel the staircase out as an access point to the second story. Princess dolls sold separately. Parents will love how this set goes from palace to portable playset and storage case in a few quick steps. Kids will love how they can take their play on the go! They can store all of their accessories inside, close the doors, latch it tight, and carry it with the handle almost anywhere their dreams take them! The new Hairdorables from Just Play are the hottest toys of the year. See why you’ll fall in love with the Hairdorables Mystery Dolls!